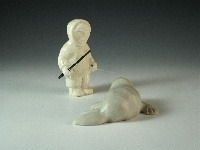 A smaller Nokalak carving but exhibiting the same artistry as his bigger pieces. Tusks are carved from actual walrus teeth. Fat Walrus standing on all fours. 20.3cm L x 5.7cm W x 12.1cm H.